Each protagonist has a sibling that is (or was) close to them: Connor has a twin sister, while Gwen has a brother who is barely a year older, a brother who has become more distant and hostile since they moved into the house. Meanwhile, ten years earlier, Connor had a similar temperament, giving into dark thoughts and violent urges, seeming to feed on the evil energy of the house while simultaneously it fed on him. The parallels between the two stories grow more evident as the story continues, and then things begin to line up, overlap, and explode. The dual narrative definitely works in this scenario, with Gwen's fear that she is going crazy (again) contrasting effectively with Connor's unapologetic enjoyment as he embraces his darkness. Gwen thinks she's pathetic, but readers will find her sympathetic; Connor is twisted, and he likes it that way. It is interesting to note that both characters are trying to be happy in their own ways and both are pretending to be something they're not. With short, unnumbered chapters - sometimes no longer than three-quarters of a page - the action moves quickly, and the format and plotting of the story should attract and intrigue horror fans, even those with shorter attention spans. All Scam wanted was a ride home from a night out. Scam, Crash, Flicker, and Anonymous are led by their "Glorious Leader" Bellwether and call themselves Zeroes, not heroes. They all have powers, they just aren't quite "super." Maybe the phrase "in training" could be applied to the Zeroes. It's not like they don't have good intentions most of the tiome when they try to use their powers, but control seems to be an issue. When Mob enters the group, the problems and the possibilities seem to grow. The group needs to pull it together becasue the mission has gone from theoretical to the real deal. Lives stand in the balance and the Zeroes must own their powers in order to get the job done. Westerfeld, Lanangan and Biancotti pull together a fantastic cast of characters trying to find their way in the world. Please, somebody tell me that this will develop into a series! Whew, I looked - it's planned as a trilogy. I highly recommend this book. 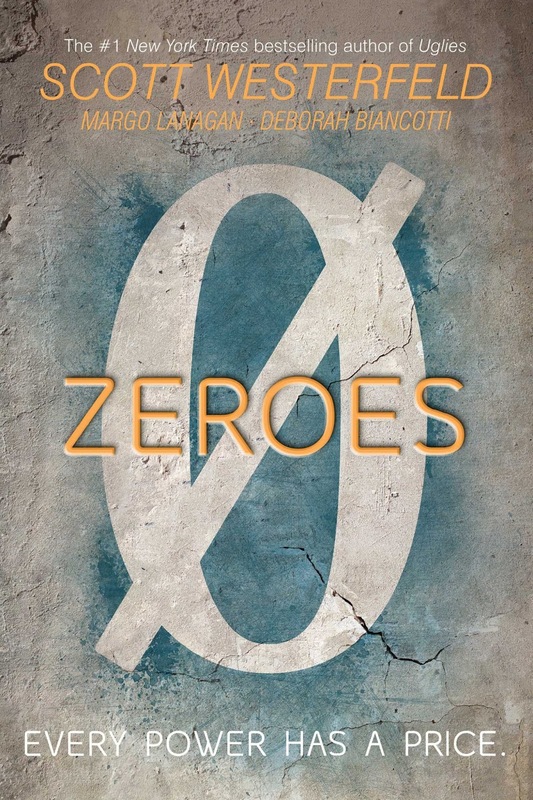 A really fun read that moves along, quickly drawing the reader into the wolrd of the Zeroes. Charlotte, Branwell, Emily, and Anne. The Brontë siblings find escape from their constrained lives via their rich imaginations. The glittering world of Verdopolis and the romantic and melancholy world of Gondal literally come to life under their pens, offering the sort of romance and intrigue missing from their isolated parsonage home. But at what price? As Branwell begins to slip into madness and the sisters feel their real lives slipping away, they must weigh the cost of their powerful imaginations, even as the characters they have created—the brooding Rogue and dashing Duke of Zamorna—refuse to let them go. There is a legend that a Great Spotted Whale lives in the ocean; local fishermen still talk of it, although the first sighting fifty years ago was never corroborated. Now, two young whale watchers each set out to find the whale, one armed with sound recording equipment, the other a camera. Mid-ocean their boats collide, so they pool their resources and set off together to capture incontrovertible proof that the mythical Great Spotted Whale exists. The eventual sighting is a magical moment: the whale is truly phenomenal, and swimming along beside her is a small whale calf. The children return to shore, solid proof in hand. As an added twist to the story, they discover that it was their own grandparents who first sighted the Great Spotted Whale fifty years ago. The Murrow’s epic, wordless adventure is brought to life with Ethan’s stunning graphite drawings, which convey the drama and haunting beauty of the ocean, and capture the majesty of this awe-inspiring creature. This is a wordless picture book that appears absolutely stunning. Artistic teens are going to love it - as well anyone who appreciates truly great art. Sure, you've heard of Bigfoot and chupacabras, but what about snoligosters, wapaloosim, and leprocauns (not leprechauns)? 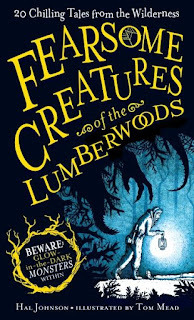 The ghoulishly fun Fearsome Creatures of the Lumberwoods introduces readers to twenty legendary and fantastical creatures, including the latter three. Our guide to the "wild and untamed" lumberwoods of North America is a cryptozoologist, one who is, "if I do say so myself, at or near the forefront of my field. So many colleagues have been eaten by chimeras, incinerated by salamanders, or pecked to death by barnacle geese; there is not necessarily much competition left." Each short chapter is devoted to a single creature, accompanied by an illustration (some of which glow in the dark! ), and explains why it is so hard to find, as well as what it does to the unfortunate people who, purposefully or accidentally, run into one. Fortunately for us, our cryptozoologist narrator has encountered many of them firsthand, like the toteroad shagamaw in Maine or the whintosser in California, and survived to share his wisdom. I'd like to say that the stories in this collection are deliciously gory, except some of them involve rather unfortunate meals. Then again, considering the Acropelter entry in particular, this is probably a fitting description. I rushed blindly into reading Armada with very high expectations. 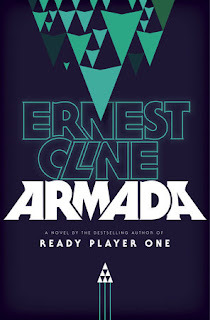 I loved Cline's first novel, Ready Player One and found myself recommending it to anyone who loved video games, D&D or sic-fi/fantasy in general. I have to be honest and say that Armada is no Ready Player One, not by a long shot. I'll start with the good, Armada definitely made me nostalgic for my youth - jamming quarters into Gauntlet & Double Dragon arcade cabinets, sitting for hours on my bed trying desperately to beat The Legend of Zelda on NES. Even the cover seems to glow with light from an arcade game. It's a novel that wants you to remember the golden age of video games, and that's kinda the problem. Zack Lightman is a seventeen year old video game nerd with a tendency for physical violence. His father died in a mysterious factory explosion when Zack was one, leaving a boulder-sized chip on his shoulder. His mother, who Zack refers to as "hot" (huh?) can recite Battle Star Galactica and World of Warcraft references better than any Cheeto-crunching basement dweller in the state. Zack finds solace in a video game called Armada, an online flight simulator he plays every night with his friends. Armada may be the reason Zack lost his girlfriend, but it's also the one thing that keeps him focused and connected to his deceased father, who was also a massive gaming nerd. After school, Zack spends his time working at Starbase Ace, a shabby video game store owned by Ray, a video game aficionado and Yoda to Zack's Luke. Zack seems happy to not have a plan in life, whittleing away the hours paying Armada and debating Star Trek vs. Star Wars with his friends. Then, everything changes. Bored in class one day, Zack's gaze wanders to the window where he sees a flying saucer, and not just any flying saucer, the enemy ones from the game Armada. Convinced that he's hallucinating, Zack tries to shrug it off. The problem is, you can't shrug off an alien invasion. Labels: dystopian , Everyone's Got Issues , Flying Cars and Lost Cities , Pop Culture , Survival , War - What Is It Good For? 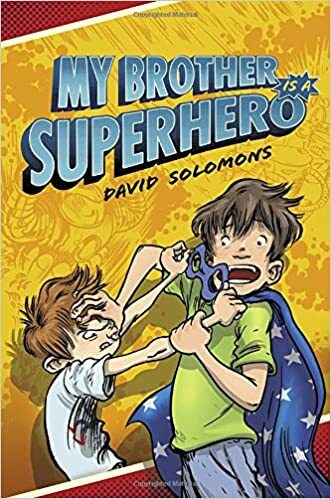 Any serious comic book aficionado can probably tell you the backstory of most of the main superheroes and probably a few of the other lesser known ones as well so well known is the mythology behind these fictional characters. The proliferation of summer blockbuster films has also helped propel the characters into the zeitgeist. Perhaps you've seen Saving Private Ryan, the film by Steven Spielberg, which opens with what feels like very real footage of landing at Omaha Beach in Normandy, France on June 6, 1944 - now known as D-Day. He has said publicly that without the photos of Robert Capa, he could not have made that movie. This book is the story of the man behind the only camera to actually reach the beach on D-Day, Robert Capa. The book opens with a 55-page graphic novel retelling of Capa's career as a photojournalist written by Jean-David Morvan and illustrated by Séverine Tréfouël. It includes a four-page fold-out spread of what the invasion looked like from the shore. It's an engrossing, gritty telling of the first wave of the beach landing, as Capa chose to go ashore with Company E (sometimes called Easy Company), one of the first companies to put ashore, armed only with a camera. Capa's surviving D-Day shots follow the graphic novel, and are themselves followed by three separate essays: "The man who invented himself", a bio of Capa; "The eye of June 6, 1944", about Capa's life during D-Day; "In the viewfinder", about Capa as a photographer; and "A face (lost) in the waves", about the identity of the man in Capa's most iconic image from June 6th, 1944. All of the additional essays include additional Capa photographs, and were written by Bernard Lebrun. Translation into the English was done by Edward Gauvin. And here's a link to that photo: The Face in the Surf, copyright Robert Capa, which is featured on the book cover (seen above). “Nobody says the words anymore, but somehow the violence still remains” (218). Jason Reynolds and Brendan Kiely wrote All American Boys together, an act of unity sorely necessary in the fragmented streets and schools of America. These two men have written a passionate story of what happens when power, anger, and privilege intersect. Of what happens when racial biases and assumptions are questioned, when loyalties are tested, and when whom you’ve stood with contradicts what you now stand for. As I listened to Amanda Palmer read the audiobook of The Art of Asking, I knew that I would also want to read it. The audiobook includes her music, and she is a wonderful reader/artist. This is one of those rare instances where I want to experience both. Because when I read it, I have time to think about, and make note of her many insights. And she IS insightful. I spent my late teens and my twenties juggling dozens of jobs, but I mostly worked as a living statue: a street performer standing in the middle of the sidewalk dressed as a white-faced bride... Being a statue was a job in which I embodied the pure, physical manifestation of asking: I spent five years perched motionless on a milk crate with a hat at my feet, waiting for passersby to drop in a dollar in exchange for a moment of human connection. Artists connect the dots - we don't need to interpret the lines between them. We just draw them and then present our connections to the world as a gift, to be taken or left. This IS the artistic act, and it's done every day by many people who don't even think to call themselves artists. Then again, some people are crazy enough to think they can make a living at it. 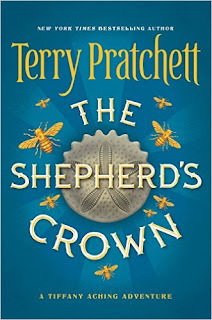 The Shepherd’s Crown is the last of the Discworld novels, a series by the late Terry Pratchett that spans dozens of volumes all set on a disc-shaped world riding through space on the back of four elephants standing atop a giant turtle. The Discworld stories take place in the back alleys of the filthy city of Ankh-Morpork, in the hallowed halls of Unseen University and in the country hills of the Chalk. They tell of witches, wizards, goblins, dwarfs, sergeants, vampires, Death, postal workers and other strange folk. The Discworld series is so vast that it contains several mini-series within the larger series. The Tiffany Aching series to which the Shepherd’s Crown belongs is the best of these, so in a way The Shepherd’s Crown ends not one but two series.